Garden decking is very robust, but it does need a little regular care. A mouldy deck not only looks grim, but it can also be a hazard if it makes the surface slippery, and it may be hiding some rotting wood. You might want to leave carpentry tasks to professionals, but cleaning the deck is a really simple task. Choose a day when the weather is likely to be dry (difficult in the UK, but not thankfully not impossible). Get to work with hot water and a squirt of washing-up liquid, and with a stiff broom work vigorously to dislodge mould and moss. If you have a pressure washer this job is much quicker, but you don’t get so much exercise. Having attacked the mould, you rinse and leave the deck to dry for several hours. When thoroughly dry, you can apply a sealant to protect the wood and keep the deck looking its best. Image included in this blog post is an example of our decking work. If you’re interested in getting us to do some of your deckings, please contact us on 029 2048 9100. 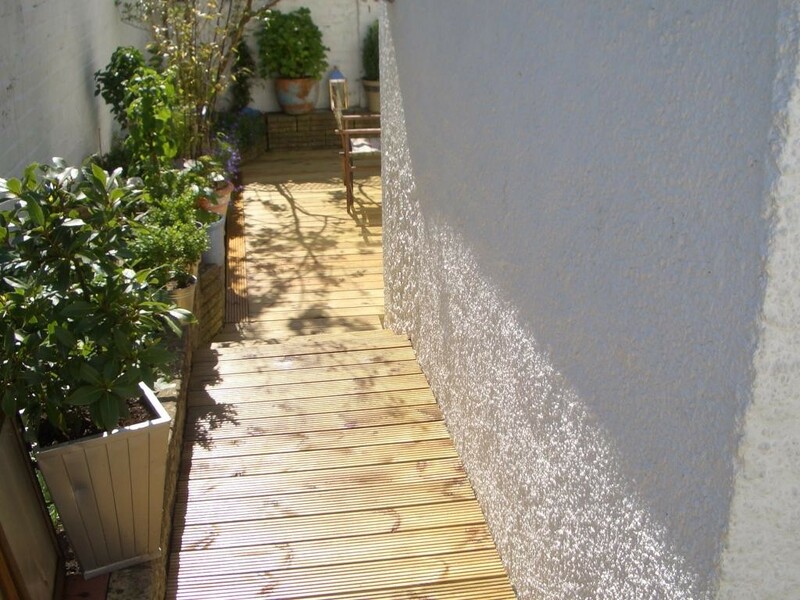 This entry was posted in Property and tagged deck, decking, garden, gardening, guide to, property, tips. Bookmark the permalink.